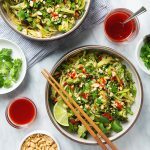 Do you have a go-to meal for those weeks when you’re in a cooking rut and would rather just get takeout? For me, pasta always comes to mind (followed very closely by tacos). I usually cook up a box of brown rice spaghetti, but the other day I tried one of my favorite vegetables in a new-to-me way: sweet potato noodles! Have you tried them? 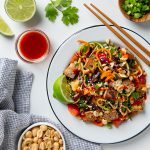 You can use an inexpensive spiralizer to make your own, or buy sweet potato noodles pre-made at some grocery stores (Whole Foods sells them in the produce section, although you’ll pay a few dollars extra for the convenience). 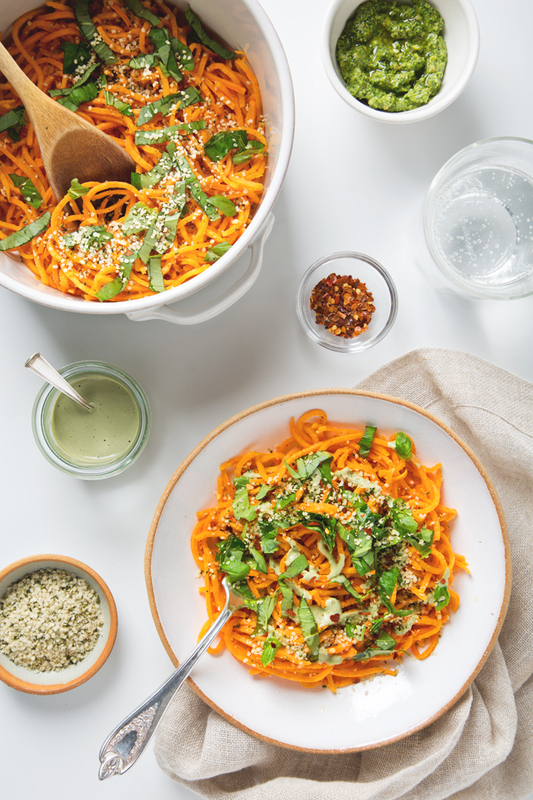 Unlike zucchini noodles which can get soggy and turn to mush really quickly, sweet potato noodles have less water and thus maintain more of an “al dente” bite. I’ve found that for perfect sweet potato noodles, all you need to do is cook the raw noodles in a large skillet with a little extra virgin olive oil for a couple of minutes, then add a splash of water and cover and steam them for another three minutes, stirring occasionally to keep the noodles from sticking. They’ll cook down quite a bit, so no worries if it initially seems like you’ve made too many noodles (one medium sweet potato per person is a good rule of thumb). The sauce here is key, and lately I’ve been making a blender pesto cashew cream sauce on repeat. It’s only a handful of ingredients—cashews, water, lemon juice, mellow white miso, and my easy lemony walnut and kale pesto that takes all of five minutes to throw together. You can buy pre-made vegan pesto (Trader Joe’s sells one that’s pretty good), but I prefer homemade because I’m picky about my pesto not tasting super oily. From there, pile on the toppings! I like sliced fresh basil, lots of hemp seeds, and a few pinches of red pepper flakes. 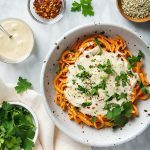 This easy, vegetable-heavy meal uses sweet potato noodles in place of spaghetti, with a quick pesto cashew cream sauce that's extra creamy without any dairy. This is one of those meals that's healthy yet satisfying, and very doable on a weeknight. You'll likely have leftover sauce (it's perfect on roasted veggies and grain bowls). Cook the noodles: Heat a large skillet over medium heat. Add the olive oil and once warm, add the garlic and cook until until golden brown, about 1 minute. Add the sweet potato noodles and toss to coat. Cook for 2 minutes, tossing occasionally. Add the water and toss again. Cover and cook, tossing every so often, until the noodles are tender but “al dente”, about 3 more minutes. Don't overcook the noodles or they will become too soft and won't hold their shape. Remove from the heat, season with salt and pepper, and portion into serving bowls. Serve with pesto cashew cream sauce, freshly torn basil leaves, and a sprinkle of hemp seeds and red pepper flakes. 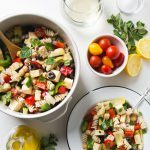 I know what I’m going to be making for dinner tonight… 😉 This is perfect timing because I literally just made pesto on Sunday with basil from my CSA. Thanks, Amanda! I cannot locate miso. What sub do you recommend? This looks delicious! 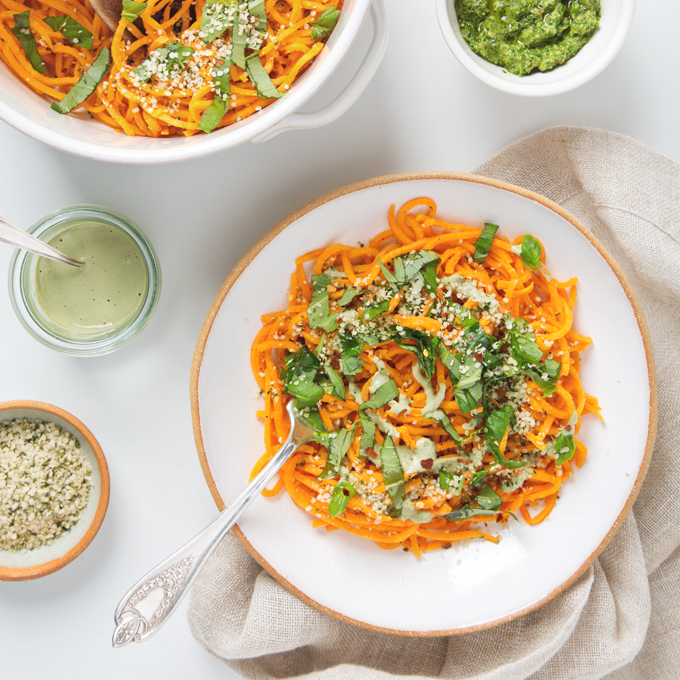 I’ve never tried sweet potato noodles before but I love zucchini noodles! Thanks, Hannah! 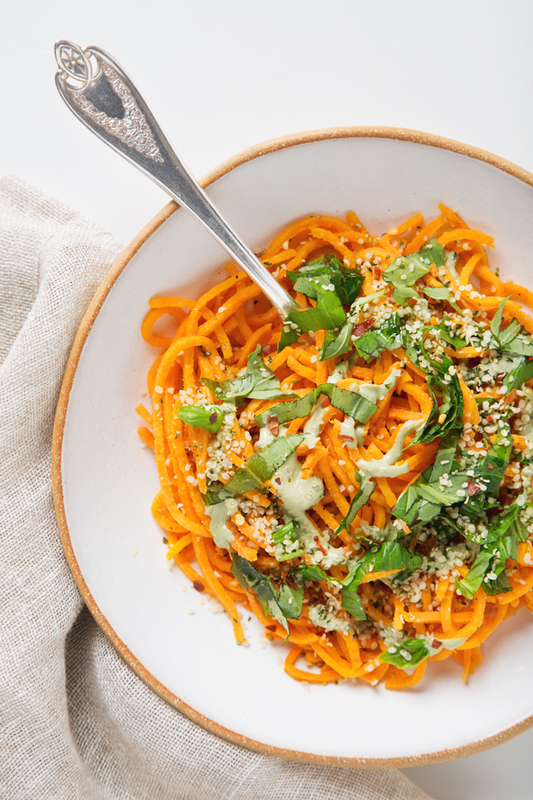 Definitely give sweet potato noodles a try! They’re delicious. This looks amazing!!! I’m trying to eat healthier and trying not to eat wheat pasta as much. Thanks, Lindsey! I hope you enjoy the sweet potato noodles!